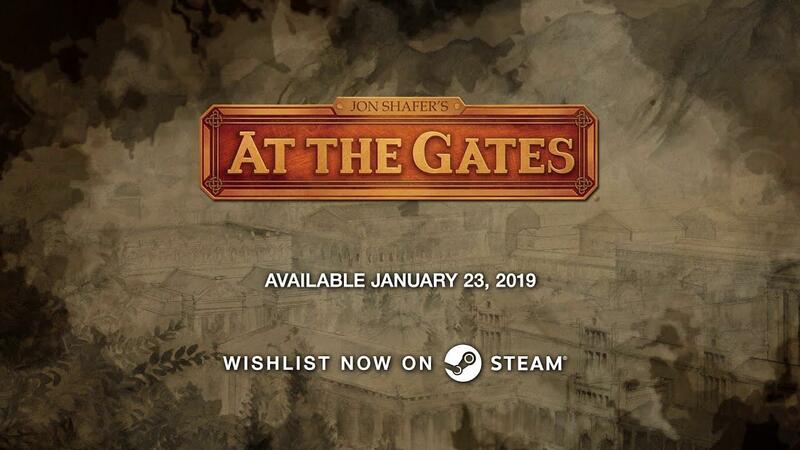 With same-day Linux support which is awesome to see, Jon Shafer's At the Gates is officially out today. Note: Key provided by the developer. Thoughts gathered from the pre-release build. At the Gates is described as a 4x grand strategy game, so with that in mind it can be a rather slow and difficult experience to get going. Especially so the first time, since you will spend a good half an hour reading and clicking through the help options that come up. There's rather a lot to take it at the start, honestly I was pretty overwhelmed by everything it tried explaining to me as it wasn't streamlined in any way. The way you control units and expand is interesting, as it's based on Clans rather than generic units you train. Each clan has a different speciality, as well as likes and dislikes. You train units from these Clans, however, they may wish to switch to a different profession and become unhappy if you don't do it. When upset, a Clan will have a penalty against various statistics like Resource Production and so on. So on top of keeping up your resources, research, expansion and more you're also dealing with some social issues that arise. You're also battling against the seasons too, since they have a direct affect on what you will be doing. For example, as tiles get cold you will be unable to forage from them reducing your food and resource production so you will need to make sure you're nicely stocked up. The way the map changes due to the dynamic nature of the game, is something you will need to keep attempting to plan ahead for. Not just true for the points above, but also how tiles supply your units while outside your borders. Each unit needs supplies, inside your borders this is no problem, outside your borders is another story. Tiles provide different levels of supply to your units, which will reduce when cold and some tiles give no supply at all. If they run out, they will start getting weak. There's tons of mechanics like that, which keep it interesting and heavy on the micro-management of each individual. Each play-through will be rather different to the last as well, much like a lot of games now it has plenty of random generation so the map and what you face each time will present new and different challenges. Naturally, this pushes you to constantly change how you play the game and it can help keep it interesting especially for such a strategy game. For the combat, I've very little to say on it. It does nothing to set itself apart there, which is a bit of a shame when compared to the rest of it. No different than most other tile-based strategy games, click into a tile and combat happens. Your ultimate goal in At the Gates is to conquer the Romans, specifically you either need to take down the capital city of two Roman Empire Factions or take them over a little more peacefully from the inside. Honestly, it's like nothing else I've played in the strategy space. It's good, very different but also quite a slow game. Still, it didn't stop me itching to get just one more turn (and end up way too late for some real life stuff) to see what else it has to offer. Frustratingly, the in-game options are too little limited. You can't change the fullscreen mode (borderless by default) and changing the settings file directly doesn't seem to actually change anything. Annoying, as the game will display on top of the GNOME Shell and KDE interfaces on Ubuntu. So the choices are either to hide all your desktop UI elements or run it on a different screen—not great and it's made it a little annoying to test out. Apart from that though, it has been smooth. For future releases, they've already put out some of their plans. The first 6 weeks seem like they will be focused on stability and bug fixes, with further releases adding in mod support and further out than that "AI + Diplomacy" changes. For those interested on the person behind the curtains, Shafer wrote up a rather personal blog post about how they suffered some serious issues over the development of it. Just been watching this youtube video where Mr. Shafer is talking through the start of a brand new game, and quite taken by it. Oh dear, think I'll add to my Wishlist. I like strategy games a lot, but after watching reviews, I start thinking, that I will wait a bit before buying. Right now it looks like unfinished game. DMG I like strategy games a lot, but after watching reviews, I start thinking, that I will wait a bit before buying. Right now it looks like unfinished game. Same here. The game is in my wishlist, but no more as reviews are mixed. gojul Same here. The game is in my wishlist, but no more as reviews are mixed. And ... the same here. It looks interesting from a gameplay perspective, and awesome from an artistic point of view, but I'm usually not buying games on release day (and much less so before). Btw., the game is also available DRM free at the Humble store, and I do hope it eventually makes it's way to GOG (another reason to bide my time for now). Steam reviews suggest that the game is in pretty rough shape, which is not surprising after reading Jon Shafer's blog. I bought the game since I really liked Civ5 and am a 4X fan anyways. It surprises me that they actually released it already - it does not feel finished. Especially the UI feels uncomfortable with a lot of unnecessary clicks (e.g. you have one window with some selection open and want to click on the next thing in your work queue and you can't because the game wants you to first close the window you have open even though it's just information... ).